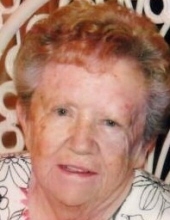 Mary Louise Irwin age 80 of Freehold, died peacefully at home on March 25, 2019. Mary Lou has lived in Freehold since 1988 moving from Kings Park, Long Island, New York. Throughout her life she devoted her time to many charitable organizations. Mary Lou was predeceased by her daughter, Kathleen and her brother Robert Caden. She is survived by her loving husband of 57 years, Robert C. Irwin, her brother Edward, her sons Chris and his wife Rosie and Tim, as well as a daughter, Kelly Henry and her husband Andy. Mary is also survived by four grandchildren; C.J., Michael, Matthew and Maddie. Visiting hours will be held at Higgins Memorial Funeral Home on Thursday 2-4 & 7-9 PM. A Mass of Christian Burial will be offered Friday, 10 AM at St. Rose of Lima Church, 16 McLean Street, Freehold, NJ 07728 followed by entombment at Maplewood Cemetery & Mausoleum 169 W. Main St., Freehold. In lieu of flowers, donations in memory of Mary Louise Irwin may be directed to https://www.vnahg.org/gifts-in-support-of-hospice. Please specify that you would like your gift directed to Visiting Nurse Association of Central Jersey. To send flowers or a remembrance gift to the family of Mary Louise Irwin, please visit our Tribute Store. "Email Address" would like to share the life celebration of Mary Louise Irwin. Click on the "link" to go to share a favorite memory or leave a condolence message for the family.